Selkirk, a God-fearing crewman aboard the space freighter Nova Maru, is forced at gunpoint to abandon ship with his captain. They crash-land on a small planet, but it is soon apparent that they have not entirely escaped the Nova Maru’s dreadful cargo. Dave Gibbons’ tale is fully realized by artists Mike Mignola and Kevin Nowlan. Dug up from the long, long ago and given a new hardcover exterior, Aliens: Salvation remains a unique spin on the world of biological weapons and faith. 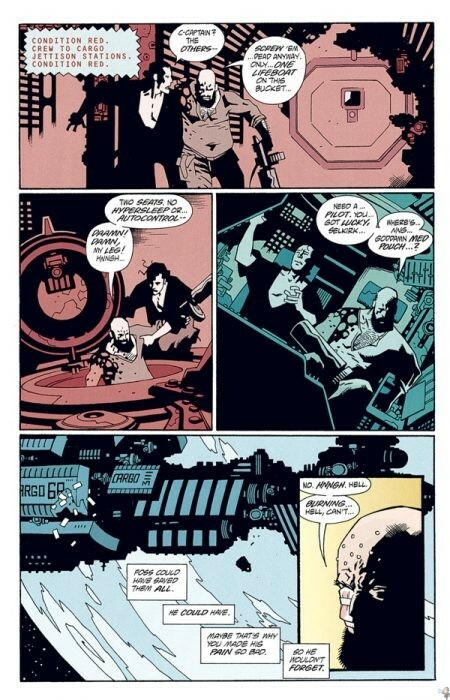 This is quite a powerhouse of talent: Gibbons, Mignola, Nowlan. Together they create an engaging and immersive story, with Gibbons leading the way through a first person narrative. Those who have been around for a while may remember this book from 1993 in its original “prestige format” outing, or from other collections along the way. Unfortunately the pages look like scans of a twenty-two year old comic: at first I thought it was the limited colour palette but no, the book looks like it was scanned from a hard copy of the former printing. 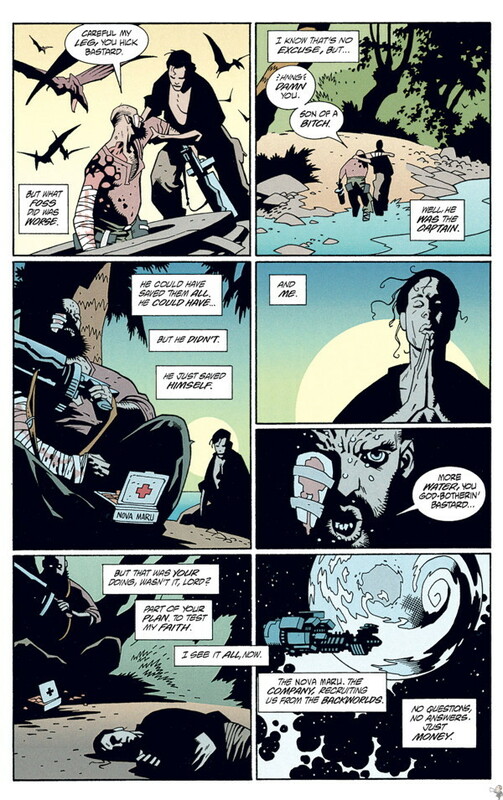 Mignola’s art in 1993 was transitioning from a very round style to his hard line black current style, but as with anything Mignola it’s well done. Lush inks unfold across the irregular panel layout: while most pages are divided into thirds it breaks to follow the action presented. Hollingsworth’s colours are soft and and muted and suffer from the scan quality. 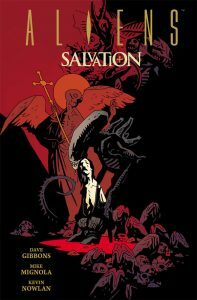 The cover, while an excellent Mignola image, does a disservice to the book. Mignola’s style is night and day between this 2015 cover and the 1993 interior. Both reflect the artist at a point in his career, and both are enjoyable, but the two didn’t need to be butted up against each other. Standard comic size, sewn binding on thick paper all wrapped in a printed hardcover with no dust jacket. A very nice package that would have greatly benefited from cleaner scans and the use of the original cover.